Published: Tuesday, March 17, 2009. New York (TADIAS) – Dr. Yared Tekabe enjoys doing most of his reflections while sitting anonymously with his laptop at cafés in Harlem. When he’s not there, Tekabe is busy running studies in cardiovascular disease detection and prevention at his lab in Columbia University’s William Black building in upper Manhattan. Last November, Tekabe’s groundbreaking work on non-invasive atherosclerosis detection and molecular imaging was published in the American Heart Association’s journal, Circulation, along with an editorial citing its clinical implications. Dr Tekabe’s success has helped his laboratory, headed by Dr Lynne Johnson, to receive another $1.6 million four-year grant from the National Institute of Health to continue his research, and Tekabe hopes that in a few years time his work can help heart disease prevention efforts and early detection of atherosclerosis in humans. “What is atherosclerosis in layman terms?” I ask him, trying hard to correctly pronounce this tongue twister. He breaks it down to its linguistic roots. “Atherosclerosis comes from the Greek roots athere which means gruel, and skleros which means hardness or hardening,” he explains. Further research in Wiki reveals that atherosclerosis is a condition affecting our arterial blood vessels, which transport blood from the heart to the rest of the body. Atherosclerosis is the chronic condition in which inflammation of the walls of our blood vessels lead to hardening of the arteries. “It’s the Tim Russert story,” Tekabe says, providing a recent example of what undetected levels of plaque formation in our bodies can lead to. EverydayHealth.com, an online consumer health portal, had described the famed former MSNBC ‘Meet the Press’ host’s sudden heart attack as being caused by a plaque rupture in a coronary artery. Russert had previously been diagnosed with heart disease, but his atherosclerosis was asymptomatic. He had not experienced the common signs of chest pain and other heart attack symptoms to warn him or his doctors of his true condition. The undetected inflammation in his vessels and the subsequent rupture of plaque led to his sudden heart attack and untimely death. This is not uncommon, however. According to the Centers for Disease Control and Prevention (CDC), heart disease “is the leading cause of death for both women and men in the United States, and women account for 51% of the total heart disease deaths.” There is even more grim news: United States data for 2004 has revealed that the first physical symptom of heart disease was heart attack and sudden death for about 65% of men and 47% of women with CVD. The risk factors for atherosclerosis are well known and Tekabe runs through the list with me: “diabetes, obesity, stress, smoking, high blood pressure, family history of CVD, and diet” he says. “But of all the factors that I have mentioned, I would say diet is the most important one to change,” he adds. Food items such as red meat, butter, whole milk, cheese, ice cream, egg yolk, and those containing trans fat all put us at higher risk for plaque formation. The American Heart Association recommends eating fish such as salmon, herring and trout instead of red meat, as well as eating food that is steamed, boiled or baked instead of fried. It is better to use corn, canola, or olive oil instead of butter, and to eat more fiber (fruit, vegetables, and whole grain). Notwithstanding that March is deemed National Nutrition Month by the American Heart Association, changing our diet is largely emphasized in CVD prevention. We should also be exercising at least 30 minutes each day. “Early non-invasive detection of the presence of inflammation and plaque could save lives,” Tekabe points out. “But the problem is two-fold: those who suffer from atherosclerosis do not display warning signs until it’s too late, and for doctors, a non-invasive method of detecting atherosclerosis is by and large not a possibility.” Research by Tekabe and others may soon change the way doctors can detect atherosclerosis. Using molecular imaging techniques that were previously popular in cancer biology research, Tekabe and his colleagues have discovered non-invasive methods of detecting RAGE, a receptor first discovered in 1992 and thought to have causative implications in a host of chronic diseases ranging from diabetes to arthritis. Tekabe, collaborating with Dr Ann Marie Schmidt who has shown that RAGE receptors play a key role in atherosclerotic inflammatory response, notes that these receptors can be detected non-invasively in mice that have been fed a high-fat, high cholesterol diet. Left Image: Atherosclerotic aorta: The image is from a mouse fed a Western type of fat diet (high-fat, high cholesterol diet) for 34 weeks. It shows complete blockage of the aorta and the branches that supply the brain. The plaque is made up of fat and inflammatory cells. Right Image: Relatively normal aorta: This is from 6 weeks old mouse fed a normal diet. Tekabe’s recently published research showing detection of RAGE receptors responsible for arterial inflammation was funded by a grant from the American Society of Nuclear Cardiology as well as from an American Heart Association Heritage Foundation award. Tekabe came to Boston in 1990 and subsequently completed his Bachelor’s degree in Biotechnology and his Masters and PhD in Biomedical Sciences with a focus on CVD and drug development. His academic choices have inevitably led him to his career as a scientist, but he has personal reasons for choosing this path as well. Tekabe hopes that his research will be applicable to other areas where RAGE receptors have been hypothesized to play a central role. Circulation editors who follow Tekabe’s work have noted that “in addition to its role in atherosclerosis and the development of vascular complications in diabetes, RAGE possesses wider implications in a variety of diseases, such as arthritis, cancer, liver disease, neurodegenerative disease, and sepsis, which underscores the importance of the ability of its noninvasive detection.” Tekabe, as part of Dr Ann Marie Schmidt’s team, has already filed U.S. and international patents and has plans to jump-start a drug development arm of the pharmaceutical industry in Ethiopia. “I’m looking for interested sponsors in Ethiopia who can see the potential of this research and its global implications,” he states. Now that Forbes has apprised us of the billionaire status of an Ethiopian-born businessman, we hope this news may peak his interest in helping to start scientific research initiatives in Ethiopia. Non-invasive atherosclerosis detection in humans would be a major break through in Medicine and would help prevent so many sudden deaths that occur as a result of heart attack, stroke and alike. Magnificent talents such as Tim Russert and a growing number of ordinary Ethiopian men and women, both here and especially in Addis, are dying young as result of the same medical problems. I really believe that in America and urban Ethiopia like Addis, we must change our diet to be healthy. Having said that, please allow me to congratulate you Dr. Yared on your groundbreaking research in Atherosclerosis! Keep up the good work. You are serving humanity via your education. Dear Editor in Chief Tseday Alehegn: Also, please allow me to extend my best compliments for your wonderful penmanship and first class magazine. You are a talented young writer. I always follow your writing on Tadias. May god grace you with a very long life and your friends! Great, uplifting personal story! Keep up the good work!! This is really an exciting result. Congratulation on your work and publication. Finally i would like to send my great appreciation to Tseday for the wonderful presentation. Very well explained in a simplified way. Great job!!! It is ever so wonderful to see one of ours rise to the top as a research scientist. Whoever said that the Nobel Prize in medicine is a private reserve for the likes of Luc Montagniers of this world? Sorry to hear the passing of your dad. Long,long before you were born a hometown poet wrote a few lines of verse about his friends and I think your beloved father was one of them. It went like this. Keep up the good work dear Yared! We are proud of you. A source of inspiration and pride for other youg ethiopians both here and back in home. Wishing the best of lucks for all Ethiopians struggling day and night for a better future. May God bless you. Thank you so much, Tseday, for sharing this inspiring story and for allowing others to read and acknowledge the achievements of Dr. Yared Tekabe. Your article is so well written that it is educational. Thank you again for promoting and highlighting the accomplishment of this capable young man to your readers. It gives me a sense of pride when I read such kinds of encouraging stories about the achievements of my country people (!?) He is an inspiration and a role model for all and I hope your article will start our youth in the journey of the pursuit of excellence. I am going to pass on the article. Thank you Dr. Yared for this wonderful finding that will save people’s lives. God has shown you the light and you have followed it. I really honor your dedication. I am so proud of you. You are one of the Ethiopians who can make a big change in this World. This is the time. Dear Tseday, I really loved your article. Keep on bringing more successful Ethiopian stories. Dear Tseday Alehegn would you write about HIV awareness. I just want to mention about HIV and our community. I have a chance to spend five weeks in one of the HIV clinics in Metropolitan area of DC learning about HIV and the number of Ethiopians overwhelmed me. Even though the Ethiopian community is trying their best to spread the word, I don’t think our community is fully aware of the situation. Please Interview one of the Ethiopia Infectious Disease physicians in DC. Keep up the good work Doc. You are an inspirational to us all. I’ve read your publication on American Heart Association entitled “Feeling the RAGE in the Atherosclerotic Vessel Wall” published in November, 2008. I was very impressed and proud to see my brother’s hard work and dedication finally paid off. Scientist like Dr.Yared is what Ethiopia needed at this point. Individual who has the source should work with young and intelligent people like him to restructure the the underlying framework of Ethiopian Medical facilities. I honestly think that CAD is a common disease in Ethiopia. Finding a cure is the absolute solution. Please continue your hard work. I congratulate you my brother, Dr. Yared for your hard work. Your dedication to Medicine is so vital to anyone in this planet. I am so honored to see my father’s dream fulfilled as well as yours. Dear Editor in Chief Tseday Alehegn: You have done a wonderful job in documenting the article. I wish you all the success. Hi dear Yared. I am wondwossen fiseha. I am proud because you are from my city and bgs school. I want to contact you also you can e-mail me wondwossen542@yahoo.com. I’m Martha Haile, Sister of Negede, Tegene and Mulatu Haile From Dire. I’ am so proud of you. I Can’t wait to let my family know about your great work and people who knows you since BGS or Notre Dame. If you can please contact me mhaile@clacorp.com. Congrats Dr. Yared! We are truly proud of the milestone you have reached so far. We are rooting for you to win a nobel prize. Ababeye is surely smiling from heaven. Keep up the great work. Tseday, as always, you are a brilliant writer, and I enjoyed your awesome journalistic style. Bravo Dr. Yared T. Great Work, Keep on Going and Going!!! Many renowned researchers having spent all their lives discovering so many valuable fallouts for humankind on this planet. Yet, when they were on their last minutes to pass away they all invariably felt that they left so many unconquered research frontiers behind that they would have conquered for better livelihoods to humankind than their own. Yared, let us reassure you that you are now more conscientious than ever before to keep on working for more and more breakthroughs from you research work in the years to come. Your Dad and we all believe that the Promised Land, the Heaven we all aspire to go to is here on this Earth. You have joined those researches who are working hard to bring healthy livelihoods to this planet in the future days to come and trust us that there will come days when we will all live happily without diseases, wars and hunger if work together. We are proud about you and we wish you all the best. Great work Tseday Alehegn, Tadias Magazine. that is such a great, fantastic and intresting job Dr.Yared T.
i am really proud of you and your team. so keep working on it, cause it is what we all need. Congrats Dr. Yared. Your story about your dad was touching. He must be thrilled in heaven amongst all the prophets. We know even from science that energy never dies, but transforms itself from one form to another. He may not be with you physically, but he is with you spiritually. I’m proud of you. keep up the good work. How blessed to be a fabulous model for everyone. Dr. Yared, may God help you to accomplish your influential goals. Dear Dr. Yared, I congratulate you on your success in your paticular study. Well done! Though I applaud the many wondeful things that medical science had given humanity, please, do allow me to share my concern regarding the ethical side of science in general. I believe those, who do have the access to knowledge in conducting whatever research on/for humans should take the matter very seriously in terms of Ethic and moral. world’s most prestigious research centers, have been criticized by the U.S.
government for failing to protect human subjects adequately. Every year, we hear that several Ethiopian trial participants are injured or killed. The tragic part of the whole experimentation is that targeted individuals have no clue that they have been used as guinea pigs. As Ethiopian Americans, I think everyone involved in higher medical or biological research, testing drugs on Ethiopians or using their blood and DNA for further experimentation, has a moral and spiritual obligation to inform the individual or the community – even if they have to lose their job or career aspirations. I really admire those who work hard for the wellbeing of every human being! omg…. i`m speachless! i was looking for some ethiopian art and i don`t know how i landed here but i`m realy glad i did good work. hey..,i can`t say god bless you `coz, you already blessed. Dr. Yared… you accomplish victory step by step… then the bright you are, the more blessing and success comes to you. I’m proud that my brother discovered the most wonderful job…. keep it up….we all Ethiopians loves you. You’re truly professional in presenting this complicated disease. You’re very talented. I congratulate you on your success. Your dedication and commitment to solving this disease is PRICELESS. I’m so proud of you. Your hard work will save so many lives in the world. Tseday, your writing is flawless. I thank you so much for publishing Dr. Yared’s work. I am so proud of you… Usually anything that is posted about Ethiopia is the hunger, disease or War. I thank you so much for changing people’s view. Keep up the good work.. In response Abram’s note: I appreciate your response, but we need a positive vibe.. I am very glad that people are recognizing your amazing work. I am going to be following your great accomplishments for years to come and I know that the best is yet to come. I hope that we will have many more coffees together at our beloved Harlem and can’t wait to hear your upcoming studies and aspirations. Tseday, your writing is flawless. I read this article more than 5 times. Keep it up sister. I really admire those who work hard for the well being of every human being! Dr Yared, you accomplish victory step by step I’m proud of you. keep up the good work. Oh BTW, It takes a talent and a touch of a prolific writer like Tseday to take a complex subject like this one and deliver it to us in such a layman’s term. My hat off to your writer and keep up the great work. I have bookmarked your site and become a frequent visitor. We’re very happy for your success. These is from all your families in Ethiopia. This article was probably one of the most easily accessible pieces on medical research I have ever come across. The research that Dr. Tekabe is doing in the field of atherosclerosis detection seems essential in the fight against cardiovascular diseases and his research in relation to RAGE could lead to further discovery across the board of health issues that plague man today. As a senior in high school in the process of deciding on colleges and possible majors, I really appreciated this article’s insight on the life and work of one ethiopian professional. It was written for any layman to be able to understand and appreciate the research being described. Dear Dr. Yared Tekabe. I am proud to see one of my own family member rise up to be a great scientist. You are an inspiration and role model to our youth. In your spare time, which you may not have, could you speak to the youth? They need your uplifting story. Great job. Thank you for sharing. This is a highly informative and ideally a life altering jar. Particularly for those of us who like to partake of the “Fatty” foods. This work is a rather graphic reminder for all of those who are still resistant to being health conscious in what they consume on a daily basis.I look forward to reading more ground breaking work from you in the future. Much Kudo’s for this important contribution. Dr Tekabe congratulations on your achievement in the field of medical research. One can achieve his or her goal if he or she puts heart and mind to it. And You did. I am proud of you. your work benefits all human kind and opens doors for your fellow young Ethiopians. Dr Yared Tekabe. Congrats! I am really impressed with your remarkable medical research. Keep up the good work. Good job. Everybody is proud of you. God bless you. It is a wonderful work you did. I wish you more success in your life. I congratulate you on your impressive research and discovery. Identifying atherioscrelotic plaque non-invasively could save millions of lives by enabling medical professionals to detect potentially lethal illnesses early. It’s about time that we change our dietary culture and tame the urge or craving to consume immoderate amounts of foods high on bad cholesterol. But more important is to be able to educate and enlighten fellow Ethiopians back home. Wouldn’t it be wonderful if businesses like Sheraton Addis sponsored a symposium to be led by Dr. Tekabe aimed at imparting and sharing informaton with aspiring nutritionists, health profession trainees,etc. and involving media outlets (Eth. Tv, radio stations, newspapers)? What do you think? Let’s keep the idea alive! Tseday/Tadias: Thank you for the beautiful and effective presentation. Thanks Tseday Alehegn, the article is well-written and uplifting story. Dear Dr.Yared, I congratulate you on your achievement in the field of medical research. You are an inspirational to many Africans, specially Ethiopian. I am so proud of you my dear friend. Keep up the good work my dear. God bless you and your family. Congrats Yared! This is an inspiration for all of us. I dont think I can fully understand the depth of your as I am not in the field. I feel so greatful for you Dr Yared, for this great research, to accomplish his goal on finding ways to diagnose early heart problems. Congratulation Dr and Job well done!!!! I always new there was something special about you. I feel so blessed knowing that my brother in law is about to become a famous scientist and multi millionaire. A party in Vegas for your achievements is way overdue. I don”t know what to say but this issue as it touches all human beings so I am proud of you doctor Yared. You did a good job and god bless you. Cheers. First of all, I would like to thank the author Tseday for a wonderful job to reach out to an Ethiopian doctor who is doing a wonderful thing for everybody in this particular and important field to find and to expose to the world his achievements and his success. Dr. Yared is a role model to all of us. Hopefully very soon he will be a Nobel Prize recipient for the invaluable research that he is doing. Last but not least, I’d like to congratulate you for your good work and for representing all of us well to give us a source of pride as well as those who came before you in the past. Keep up being a role model and we all are very proud and appreciative of your work. Great article by Tseday. Dr Yared, we are all proud of you and as you blaze new trails in the groundbreaking research that you are doing, you remain a role model for future scientists. Inspiring Article! From my conversations with Dr. Yared, I know he is a rising star! I would also like to compliment Tseday on her writing! Lastly, I would like to respond to a post by Abram (Mar 21st, 2009 at 9:36 am) concerning Research Ethics. As a research scientist myself, I am well aware of the ethical issues behind doing research on humans. But before any research gets to clinical trials, a series of extensive toxicity and proof of principle experiments are carried out. Unfortunately, things cannot be stopped after animal studies since what works in animals does not necessarily work in humans (If it did, we would have developed a vaccine against HIV and cancer a long time ago). For the vast majority, when drugs reach clinical trials, they should not be deadly since preliminary research should show that it is not toxic before getting to that stage. So unless you are referring to people doing research that is not regulated, it is very uncommon. This is really great. I’ll be very careful with my diet from now on. Saying that this is great work is certainly an understatement! It is so empowering to find our African brothers not only digging their way out of the status quo, but to get to the point where they are making their own discoveries and most importantly not forgetting to bring the knowledge to the motherland. I am impressed, inspired and thankful for the likes of Dr. Tekabe. Good bless, I know you can continue to make great things happen. Congrats on your amazing work, it is so uplifting to see your commitment to developing medical and scientific breakthroughs. We’re so proud of you! This is a wonderful work! I am sure it is a result of hours and hours of hard work. Enjoy and best wishes for the future! Congratulation Dr. Tekabe! I am very proud of you; besides, I admire your motivation for this kind of research. What you are doing is a big deal for our world, and it is an alteration for our Country’s name too. I just say keep on it & God bless you! I just heard you had a baby son… congrats for both your research and you new addition to your lovely family, and two daughters. I am quite impressed and elated about your scientific research and significant contribution for humanity to conquer Atherosclerosis, a number one killer disease as we know it. More than anything else Yared, I must recognize and congratulate you for your VERY hard work and sacrifice over many years. You are very focused, disciplined and know exactly what you want to accomplish in life. These are some of your rare qualities which I am always inspired by. Thank you so much for making us feel so proud inspired indeed! May the good Lord bless you and your family! I am really happy for you. keep doing the good work Yared! I am proud of you and congratulation my friend. Dr. Tekabe… I recently met you at work and did not realize that I was at the presence of greatness. I am honored to have met you and I would like to take this opportunity to congratulate you on your research and the many more to come……I am sure we have not heard the last from you. Keep up the good work Dr Yared, it’s important you keep searching for ways to prevent the illness from occuring and also warn the youth before it happens…it has been a great pleasure having conversation with you as well as reading your research. Dr.Tekabes; Congratulations on all your success and great achievements throught out your professional career. I look forward on reading more of your publications in the future. First thing first, I would like to commend you for tremendous job you’re doing. Second, I think its eye opening and instructive critique. Most of us know craving for those fatty food had unprecedented side effect, yet we tend to pay no heed to it until it’s too late. I think it’s very serious diseases, fortified with lethal weapon. Dr. Yared we thank for your perseverance and commitment on your research, and I’m sure your exceptional work change people’s life ceaselessly. I commend you for your hard work. It is an uplifting story. You have set an example and hope many more young Ethiopians follow your path.It is great accomplishment and keep up the good job.Thanks Tadias for sharing such great news and work with all of us. I am so impressed and proud of your discovery! This is such great news, and coming from my uncle! I hope that this break through will help those in need and fulfill your dreams. I’m so happy for you Yared, and getting the chance to read about your work. I wish the best of luck to you! You make us all proud!!! Hey Yared. We expected nothing less. Very proud of what you’re doing, bro. Hey Dr. Yared. We are all very proud of what you are doing and I hope the almight lord will enhance your knowledge to keep doing your work. keep-up Brother. is in your hands. I plead with young Ethiopians–where ever they may be– to take Dr.
ought to be the defining justification for our existence on this Earth ! This is, indeed, a great step for not only science, but also for human race as a whole. This one genius contribution for humanity can resolve the challenge our race- human race- is facing to survive withing the ups and downs of nature. As a result of your, Dr Yared, and your colleagues admirable effort, work and considerable moments of monotonous researching, significant amounts of pathetic deaths are guaranteed to be curtailed. I admire your and your teams work, plus your personal struggles to improve the duality of medical world. It is not long,I strongly believe, before I see you, furthermore, on CNN or BBC with Nobel prize for your deserving accomplishment. No doubt you will keep the excellence up; therefore, thank you, already, for your wonderful contribution for humanity, and I will look forward for the application of your empirically successful technique. Jobs well done Dr. I’m so proud of you. You are doing an important work. It has value for all of us. Thank you. Dr yared Tekabe , you are an Ethiopian hero! I lost my father to stroke! , as you know cardio and high blood pressure are the number one silent killers in Ethiopia , I hope your research will bring some good news , I wish you all the best and don’t forget that your father’s prayer in heaven also will help you, believe me! Thank you all so much. I’ll update you on my progress with the help of God! in their studies keeping Dr. Yared as role model. Keep up the good work!! I’m happy that you have achieved this level of groundbreaking research on Heart Disease. Keep up the good work! A belated congrats on your accomplishments. I am Very proud of you. Keep up the good work and make us proud again and again. I am even more proud to have been born in Dire Dawa, like you! It takes a great deal of effort to come up with such a breakthrough and it is my honor to have known such a great scientist. No doubt that this will not be last one because more shall come from you. I am really glad to come across you in person and have known you. I wish you all the best in your upcoming projects. Many thanks foe the brilliant Article. keep up with the good work. Dear Dr. Yared, It is indeed great to read about your cutting-edge research in combating coronary heart disease. The fact that your approach is non-invasive makes it even more exciting.Great job! You’ve also highlighted the importance of adopting healthy habits during the interview, which is pivotal, if we want to win the war against heart disease and in general against non-communicable diseases such as cancer, diabetes etc. I’ve developed a DVD in Amharic recently. “Teninet Bemircha” is a 75 minutes DVD with special emphasis on prevention of heart disease, cancer and diabetes. Prevention is indeed better than cure! I specialize in lifestyle and preventive medicine and I would love to send you (and Ms. Tseday as well) a copy of it, if I could get your address. It is a privillage to read about a fellow Ethiopian conducting groundbreaking research. It is truely a motivation and great pride. Thank you and keep up the good work Doctor. You have done so much for the world. Thank you and keep up the good work. 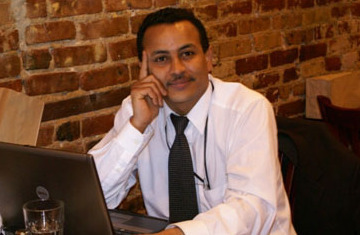 Hi, Dr.Yared , it is a great deal of work ,so proud of you . great job . hop you will do more .